The bottled water industry in India is evolving with ground breaking pace. 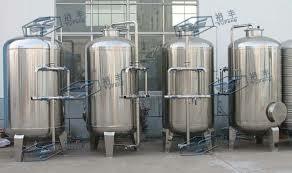 Various water purification and packaging industries are entering into the marketplace to cater vast demand graph. Bottling India (Indian ION Exchange) is amongst one of such dedicated and innovative solution providers. We deal in purification, mineral treatment and safer packaging of treated water in bottles. Our turnkey solutions in bottled water manufacturing arena have empowered our clients to accomplish their anticipated goals. The process of installing a plant for water treatment and bottling is not easy. There are a lot of research & development involved in this process. Our learned and intelligent professionals aim to bring the best of their knowledge and expertise together to deliver the desired solutions. Deep inspection of technical specifications of machines and parts being used in plant installation process. Application of cutting edge technology based products during setting up and repairing of the plant. Focus on automation rather than manual functioning of the plant. Integration of quality based machines & spare parts together to construct robust plant structure. Whether you require machines like bottled water dispenser, water filling machine or consultation on installation and maintenance of the plant, choose us to experience excellence.